It is time to start differentiating the types of triangles, the police have given you the task of in-house detective. You are officially part of the investigative team, and you are going to help identify and isolate the offenders to restore justice back to society. To do so, you have to see if the suspects’ descriptions provided by the police align with the character profiles on file. Here is an example of a scenario involving triangles: If the given description states that the suspect has three equal sides, and the criminals lined up are a scalene triangle, an isoceles triangle, and an equilateral triangle, you will know that the suspect is the equilateral triangle because among the types of triangles presented it is the only one that has three equal sides. Through previous investigative experience, you understand that a lot of shapes share some of the same qualities and angles. Looks can be deceiving, so take your time to inspect each suspect and their properties. The description “quadrilateral” could lead to a square, a rectangle, a trapezium, or even a kite. With multiple types of triangles, identifying them would be no easy feat either. 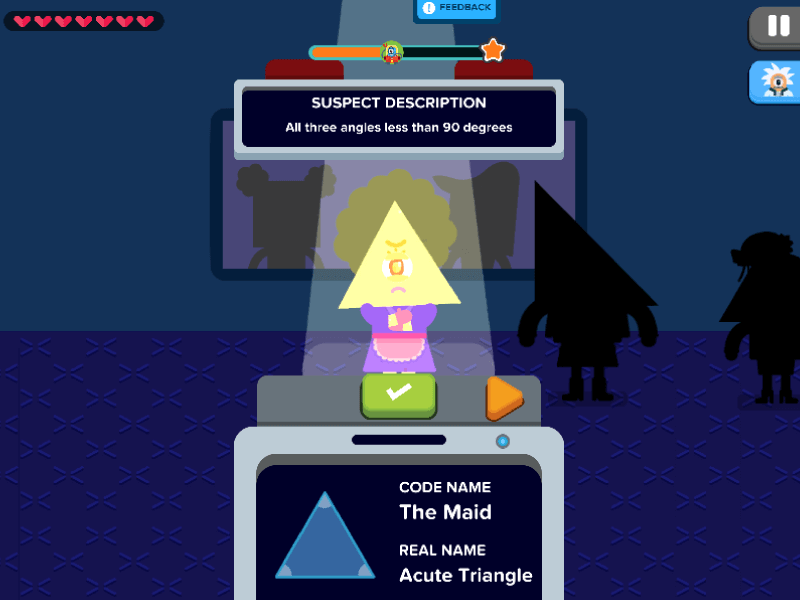 Shape Detective is a game that allows you to participate in a fun and mysterious investigation of shape characters and their varied measurements. By studying the descriptions and summarizing an answer, you are learning the shapes and their many attributes. Shapes can share similar attributes as well, therefore analyzing the options requires a very skillful attention to detail. Though identifying and comprehending shapes and their individual attributes may seem daunting at first, the gameplay to Shape Detective is so engaging that it naturally increases a player’s knowledge of the properties of triangles, quadrilaterals, and other shapes in the form of recurring practice. Careful evaluation and proper analysis is promoted all throughout the game. This contributes to a boost in math confidence as well as a steady and consistent improvement in critical thinking skills. With that said, are you ready to nab some bad angles and set them straight? Let’s set some bad angles right!